How can we 'crack' a new innovation for Magnum? The Magnum team came to us with a challenge. How can we bring the theatricality associated with a Magnum moment — the taste, the aroma, the ‘crack’ — to the humble ice cream tub? Previous attempts seemed to miss the mark — struggling to deliver the multi-sensorial experience that Pleasure Seekers expected. Over several stages, we provided insight to enable the team to iterate the product’s development. As well as insight on the early concept and positioning, we’ve brought the voice of the consumer across several markets to pack structure, graphics development, and product formulation along with LifeStream. The final product combines Magnum’s much-loved indulgence with a new and unique ceremony that heightens anticipation and adds a new sensorial dimension to the experience. 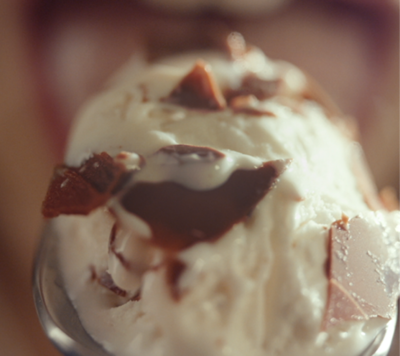 Allow the Magnum Tub to soften for 10 minutes. Squeeze the sides and listen for the signature crack. Sink your spoon into the chocolate disc that tops the tub and enjoy. 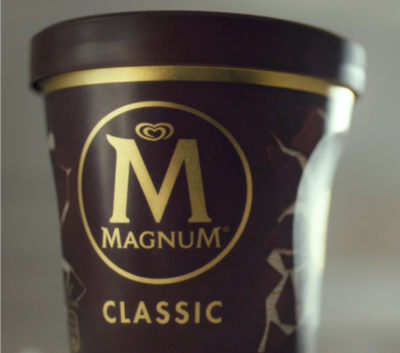 The development of Magnum Tubs follows our work to help the team move towards their ambition of becoming a global icon of ice cream by developing the ‘M’ brandmark across touchpoints. The result was an innovative, category-breaking ice cream tub with chocolate lined walls, chocolate shards and a chocolate lid. A feast for the senses — the product encourages tactility, a gentle squeeze splits and mixes the chocolate with the ice cream.